Damn, just as the snowboarding season ends! 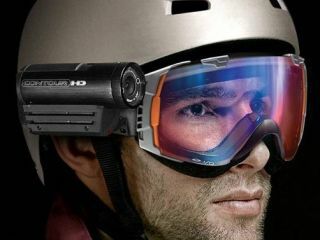 If you were in the market for a wearable high-def camcorder for this year's snowboarding season just-ended (and, after all, who wasn't?!) then this week's announcement of the world's first HD headware couldn't have come at a worse time. Twenty20's YouTube-friendly wearable camcorder is of course just the ticket for all types of extreme sports, as well as more sedate, less extreme pastimes - if you just wanted to make a nice movie of your morning commute, for example (although your fellow Tube or bus passengers might give you some funny looks...). Twenty20 claims to have 'seriously improved' the video quality, field of view, memory capacity and audio experience of its ContourHD. The latest version saves your extreme/embarrassing commute movies on a microSD card (up to 16GB which equates to 8 hours of recording time) and features a 135-degree wideangle lens and laser-guided alignment system. Out in May for $300 (£205). Check them out in action over at VholdR.com.